The James Kay engine, also known as the Dancers End engine, takes its name from Lord Rothschild's estate at Dancer's End, near Tring, where it was used to pump water from a well. The engine was built in 1867 by James Kay of Bury, Lancashire. It was donated to the museum by the Thames Water Authority’s Chiltern Division, where it had been kept on standby since the 1930s. It was found to be in good working order and was re-assembled at Kew Bridge in 1978-79. The engine has two high pressure cylinders, each connected to its own beam and crank, the flywheel being common to what are, in effect, two separate engines. This was a typical feature of engines used to drive textile mills in Lancashire and Yorkshire, and it is possible this engine was converted from textile to waterworks use. 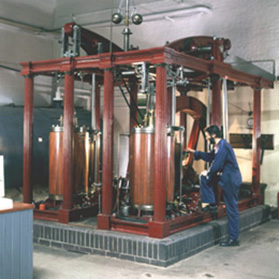 The engine drove a set of well pumps which used to be connected to tailrods driven directly from the main piston rods. Power Rating 36 horse power at 36 r.p.m.